Why Go On A Tour? Today's activities were centered around the ministry of Jesus and the north western shore of the Sea of Galilee. We started the day by being picked up at our hotel's dock by our boat which would take us upon this beautiful lake. We headed northeast and were able to view the sites of Capernaum, the Cove of the Sower, the Mount of Beatitudes and Magdala. We ended our boat ride at Nof Ginnosar and viewed a boat which dates back to the first century. It was found in 1986 while the lake level was lower than it is today. It has been beautifully preserved and they have a nice area in the museum to display it. The Mount of Beatitudes was our next stop. This hillside Catholic chapel commemorates the preaching of Jesus in the Sermon on the Mount. 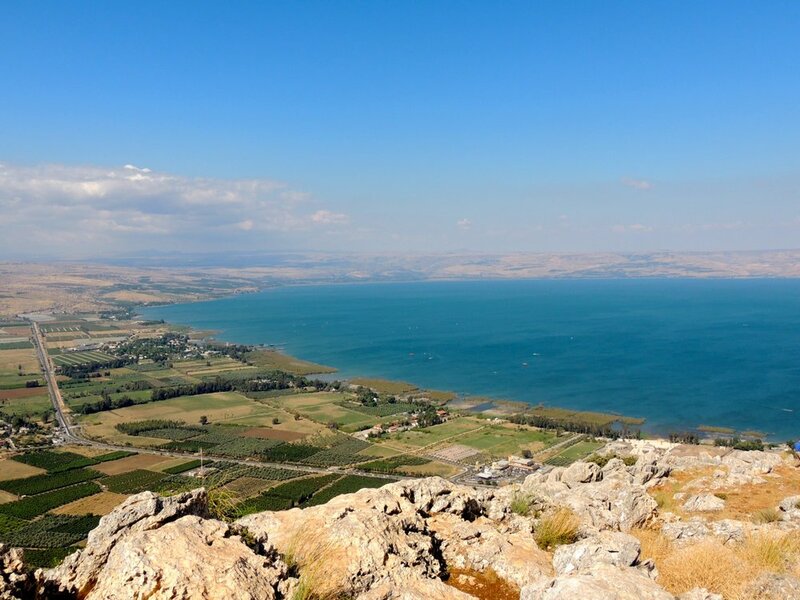 This site offers some tremendous views of the Sea of Galilee as it sits above Capernaum. From there we had quick visits to Chorazim, Bethsaida and Capernaum. I was impressed by all of the improvements that they have made to Capernaum. They have made it more accessible to large groups and many of the artifacts are more easily seen. After lunch, we went to see the new facility at Magdala. Five years ago, this site was just getting started. Now, they have a large amount of excavations available to the visitors. The prize piece of what has been found is the remains of a first century synagogue. It is possible that Jesus went into this synagogue while He walked on the earth. Many of the tour group had asked about the possibility of retrieving some rocks from the sea. This is easily done at the Church of the Primacy of St. Peter. This church commemorates the events of John 21. Everyone enjoyed the ability to walk out into the sea. Our final stop was at the top of Mount Arbel. We had attempted to visit this site on Thursday, but it was closed by the time we arrived. In hindsight, this was a blessing. Today's weather was much clearer and we were able to look down on the Sea of Galilee and discuss many of the places that we had visited today. Tomorrow morning, we leave the area of the Sea of Galilee and head toward Jerusalem. We will see many sites along the way in which we will discuss tomorrow night.